Christian Bayer is a research scientist at WIAS Berlin. He has written several papers on numerical aspects of rough path theory, especially with regard to Lyons-Victoir cubature, and also in the context of SPDEs. Former collaborators include P. Friz and J. Teichmann. Jean-Dominique Deuschel is professor for Probability Theory at TU Berlin and one of Berlin's senior stochastic analysts. Well-known for his monograph with D. Stroock on large deviations, he also collaborated with P. Friz on (infinite dimensional) stochastic analysis problems. Peter K. Friz, professor for probability theory and mathematical finance at TU Berlin and WIAS, arrived in Berlin in 2009; he is a leading figure in rough path analysis, as documented, for instance, by the two monographs Friz-Victoir (2010), Friz-Hairer (2014) and repeated (invited) lectures on rough paths and regularity structures. Martina Hofmanova, freshly arrived at TU Berlin as Wissenschaftliche Mitarbeiterin from a previous PostDoc position at the Max Planck Institute for Mathematics in the Sciences, Leipzig. She is already widely recognized for her contributions to degenerate parabolic SPDEs and stochastic scalar conservation laws. Amongst others, she has collaborated with A. Debussche and presently investigates the use of rough paths with a view to stochastic scalar conservation laws. Peter Imkeller, professor for Applied Probability Theory at HU Berlin, is another of Berlin's senior stochastic analysts. He was - all other achievements aside - substantially responsible for the paracontrolled approach to singular SPDEs. Wolfgang König, also in Berlin since 2009, is professor for Probability Theory at TU Berlin and head of the Research Group 5 Interacting particle systems at WIAS. He is a world-leading expert on the parabolic Anderson model (PAM), the continuous version of which can now be understood by regularity structures and paracontrolled distributions. Raphael Kruse specializes on numerical analysis of ordinary and partial stochastic differential equations. After first PostDoc experience at ETH Zürich, he is now heading a junior research group on Uncertainty Quantification at TU Berlin. Sylvie Paycha, since 2011 professor for Analysis at Universität Potsdam, on long-time leave from Université Blaise Pascal in Clermont-Ferrand, is widely recognized for her contributions to infinite dimensional geometry and renormalisation theory. She organizes repeatedly workshops bringing together regularity structures and paracontrolled distributions on the one hand, algebraic and analytic approaches to renormalisation. Nicolas Perkowski started his junior professorship at HU Berlin in January 2015. He spent the previous year working with M. Gubinelli at Paris Dauphine. N. Perkowski is substantially responsible for the paracontrolled approach to singular SPDEs. Recently he used these methods to solve a long-standing problem: convergence of the Sasamoto-Spohn model to the KPZ-equation. Sebastian Riedel specializes on random rough paths and stochastic flows. His PhD thesis (2013), under supervision of P. Friz and co-examined by M. Hairer, won the Tiburtius-Dissertationspreis for an outstanding dissertation; he now works as Wissenschaftlicher Mitarbeiter with M. Scheutzow at TU Berlin. Michael Scheutzow, professor for Probability Theory at TU Berlin, is another senior scientist with broad interests in stochastic analysis, especially the theory of stochastic flows, a field intimately connected to many SPDE and rough path problems. 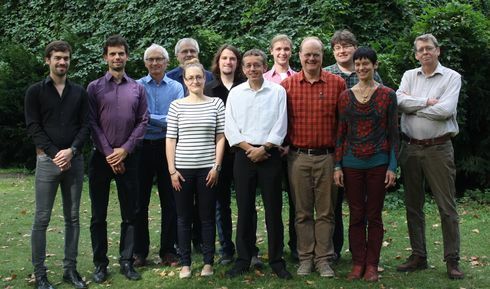 John Schoenmakers is deputy head of Research Group 6 Stochastic Algorithms and Nonparametric Statistics at WIAS Berlin, which traditionally harbors stochastic analysis and financial mathematics within the Weierstrass Institute. With extensive knowledge on numerical methods for stochastic differential equations, he recently managed to import multi-level Monte-Carlo ideas into rough paths theory. Wilhelm Stannat, professor for Stochastics at TU Berlin, is widely recognized for his expertise in the analysis of SPDEs and its applications. Most recently, he has written papers with P. Friz on the intrinsic rough path approach to the stochastic partial differential equations arising in filtering theory.